We’re building a global network of local shopkeepers and customers to support simple, risk-free cryptocurrency exchange. Add your shop for free and earn 2-8% commission on every sale. LoCoins is a turnkey solution for handling crypto to cash exchanges (and vice versa) over the counter. Cryptocurrency markets are growing rapidly, and demand for a hassle-free crypto<>cash exchange is on the rise. We support Bitcoin, Ethereum and others, with more to come soon. Easy to use for shopkeepers, cashiers and customers, and without complex accounting. Cash transactions for cryptocurrencies where and when needed, without waiting. Legal compliance, cryptocurrency liquidity, price volatility and security risks are all handled by a robust platform built by a team of blockchain experts. How does the commission work and what earnings can I expect? You can set your own commission for each type of exchange (e.g. 5% for BTC sell) depending on your local market situation. Most shops set the fee to around 6% which includes a smaller LoCoins fee. Your earnings depend on the exact amount of all exchange orders processed in your shop(s). In our experience this can mean anything from under a thousand to tens of thousand for retailers who invest time and effort into local brand awareness. What are the initial and ongoing costs; is there any equipment needed? There is zero cost to set up and run the service. The only thing you need to handle a LoCoins customer is a smartphone, tablet or computer device with an internet connection. Usually our shops will simply use the device they already use for every day work. We can also integrate to your POS/cashier system. How big (or small) amounts are allowed? We leave this decision to you. Min/Max amount can be set for each shop and type of exchange. What do I or my employees need to know and do day-to-day? It is desired that you have a basic understanding of cryptocurrencies (e.g. knowing what a crypto wallets is). Individual cashiers/employees can operate very independently though as there are only two simple steps required to process an exchange order. We also provide information, support and access to a test system to ensure you are best prepared. Is this type of business legal? This type of intermediary service is legal and doesn’t require a specific license in most countries. LoCoins has been built by the creators of a successful bitcoin ATM operator and regional cryptocurrency promoter Bitnik and has existing locations currently operating in multiple EU countries. The solution is fully compliant with AML and other relevant regulations and we are working closely with the regulators on a continuous basis as the industry evolves. Why would customers use LoCoins instead of online exchanges? Same reason as why customers are using exchange bureaux offices instead of going directly to Forex sites to exchange traditional currencies, like EUR to USD. As cryptocurrencies are gaining wider awareness more people are looking for a convenient way to exchange coins and cash, quickly and securely. What kind of shops are suitable to offer LoCoins service? Pretty much any type of shop is suitable regardless of size or type of business, as long as it is operating with cash (although other payments methods are supported too), has a permanent location and somewhat stable opening hours. You can leave your contact with us through the form on this page (or drop us a line on [email protected] and we will be in touch very shortly. After arranging a standard contract and topping up your account you can begin immediately. 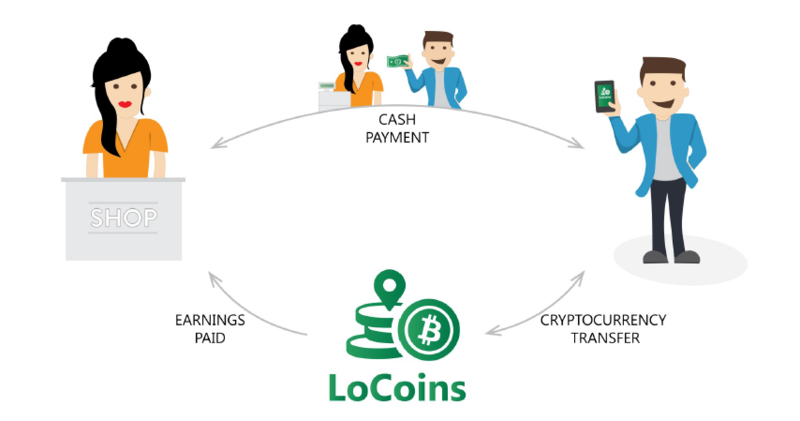 We will supply some promotional materials like stickers and flags in order to help with promotion and of course add you to our web page so that every existing and any new LoCoins customer in the area will know about your shop. Let us know you’re interested by clicking on the button above and providing some basic information. It takes no more than a minute, it is free and private, and carries no obligations. We will then send you additional information and next steps for becoming an official LoCoins Retailer. LoCoins is a service created by real cryptocurrency experts. We’ve previously established a successful bitcoin ATM operator and local cryptocurrency promoter - Bitnik. We’re from Slovenia and love crypto!